Beautiful Queenstown in the southwest corner of New Zealand's Southern Alps on the South Island is a hive of activity, with international tourists visiting year round to participate in a range of activities, from jet boating, to bungy jumping. As one of the most noted fishing areas in the world – where you can fly fish or lake troll for trout, or search for salmon in the most exquisite wilderness areas – Queenstown is a fishermen's mecca. If you love fishing, then Queenstown is the place for you! During the season, there are numerous watercourses where you can spend the day relaxing and reeling them in. Tranquil rivers and cool alpine creeks, surrounded by verdant slopes, mountain regions and beech forests, are just some of the serene and peaceful spots you can expect for a premiere fishing experience. Only three hours by air (direct from Sydney or Melbourne), Queenstown is only a short trip away from the everyday hustle and bustle of your everyday life, to some of the ultimate peaceful and relaxing fishing oases on the planet. Rivers of the Southern Lakes region and alpine lakes, Hawea, Wakatipu and Wanaka, are some of the best fishing spots in the area. With knowledgeable guides available, boats for charter, extraordinary scenery and friendly locals, you will never have a better fishing experience than in Queenstown. In fact, the scenery within these areas is so awe inspiring that many people opt for a fishing trip just to experience the blissful tranquillity that comes with this relaxing sport. Regardless of whether you are a keen angler or a complete amateur, do not forget to bring your camera! Everything Queenstown have arranged a number of fishing adventures that make the most of the breathtaking countryside and the years of experience of friendly local anglers. 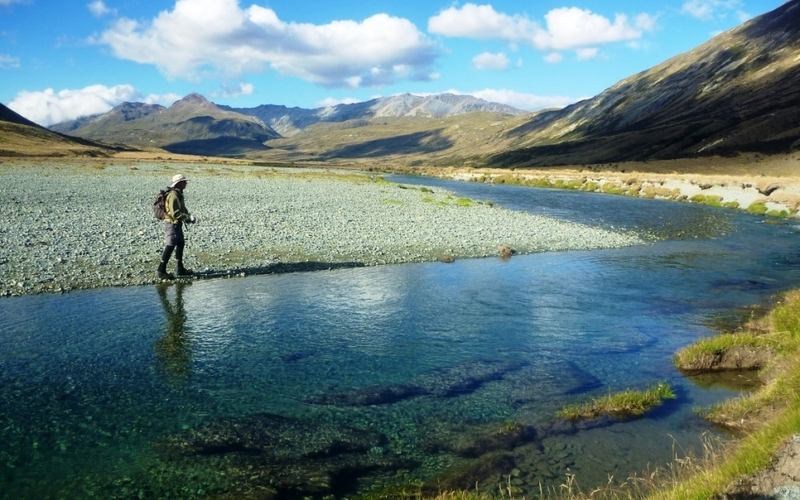 Go fly-fishing with Simon Wilkinson, who accesses some very remote wilderness areas via 4WD and helicopter for a fabulous trout fishing expedition, or join the South Island Trout Stalkers, who sight, stalk and fish Brown and Rainbow trout. If lake fishing is more your style, join Stu Dever – who has an uncanny ability to find where they're biting and a reputation for making every fishing adventure a great one! Whichever option you choose you’re sure to have a day full of scenic wonders, calm reveries occasionally (and hopefully frequently) shattered by the excitement of that strong bite and a new set of fishing memories that will last you a lifetime!